A shift away from commodity crops toward fruits and vegetables would be good for everybody's health—including the health of our rural environments and economies. Eating healthier food would not only be good for our bodies; it would also improve the health of our farmland, our environment, and our rural communities. This is the message of The Healthy Farmland Diet: How Growing Less Corn Would Improve Our Health and Help America’s Heartland, a 2013 report which uses economic modeling techniques to estimate the effects of changing food consumption on agricultural land use. The findings? Increased consumption of healthy foods would lead U.S. farmers to grow more of these foods and less of the commodity crops that currently dominate U.S. agriculture. This in turn would produce healthier soil, air and water, as well as providing economic benefits in the form of job growth and increased access to healthy foods for farm communities. Only about 2 percent of U.S. cropland is used to grow fruits and vegetables, while 59 percent is devoted to commodity crops, such as corn and soybeans, which are used primarily to produce three things: meat, processed foods such as high fructose corn syrup, and biofuels such as ethanol. Current farm policy encourages this pattern by providing subsidies for commodity crop farmers; farmers who receive these subsidies are usually prohibited from growing fruits and vegetables. Furthermore, federal crop insurance programs are tailored for commodity crop farmers, making it hard for fruit and vegetable farmers to obtain insurance and credit. Why is a landscape dominated by commodity crops unhealthy? These crops are grown using monoculture practices that rely on heavy application of fertilizers and pesticides to compensate for their soil-depleting and pest-attracting effects. Monoculture is also less beneficial for local economies than more diverse farm landscapes. If Americans ate fruits and vegetables at recommended levels, U.S. farmers would grow a lot more of these foods. How much more? The report found that if Americans increased their fruit and vegetable consumption by the amount needed to meet the recommendations in USDA's MyPlate dietary guidelines, U.S. production of these healthy foods would increase by 88 percent. Changing our protein choices could also lower commodity crop production. Because corn and other cereal grains are used as livestock feed, reducing consumption of meat and dairy products in favor of more fish, poultry, beans and nuts would result in a reduction in commodity crop acreage. The Michigan farms pictured here incorporate a mix of orchards and field crops. Such diverse farm landscapes are good for both the environment and rural economies. Health and nutritional benefits. Increased consumption of healthy foods could help reduce the human and financial toll of cardiovascular disease and other diet-related illnesses. Environmental benefits. Replacing corn and soybean acres with fruit and vegetable acres will reduce the environmental damage caused by monoculture farming. Reduced demand for meat would also lower agriculture's contribution to global warming. Local economic benefits. Increasing production of healthy foods will have ripple effects in local economies, creating jobs and spurring regional economic development. Fund and implement programs that help farmers grow more fruits and vegetables, such as removing planting restrictions, developing effective crop insurance programs, and investing in research to develop better fruit and vegetable varieties. Fund and implement policies to improve consumer access to fruits and vegetables, such as bolstering programs to help build market infrastructure and removing obstacles to the use of nutrition-assistance benefits at farmers markets. Curb subsidies that promote production of ingredients for unhealthy processed foods—instead making modest increases in funding for programs, like those above, that help farmers grow the foods Americans need. 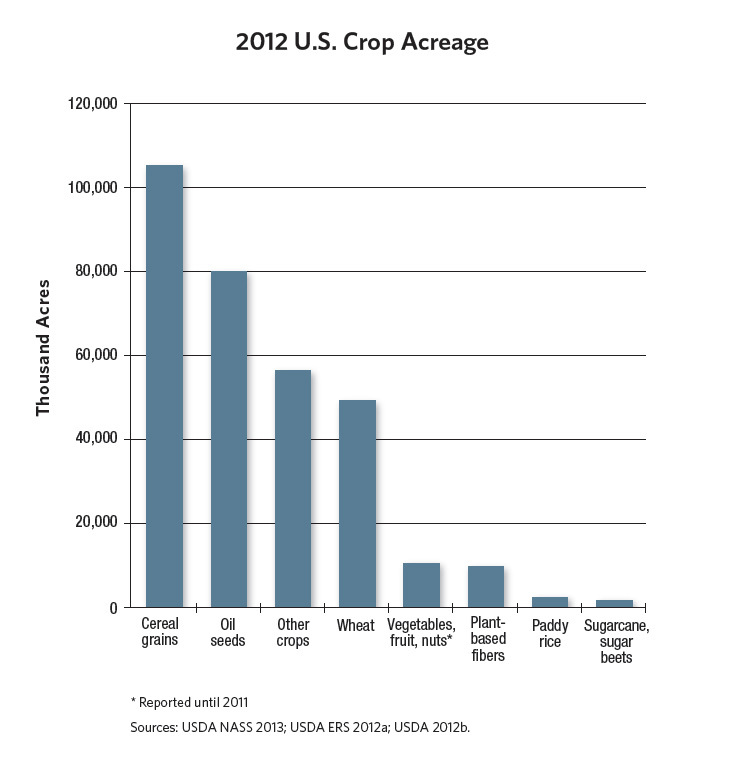 See what the USDA says we should eat, and what they subsidize farmers to grow.